Ashley Deary defends on the ball. The junior guard racked up six steals to set a new Big Ten single-season steals record in a loss to Michigan. In the midst of a difficult season, the Wildcats ended their home Big Ten season in an all-too-familiar manner. Michigan center Hallie Thome scored 22 points, matching Northwestern junior forward Nia Coffey’s 22 points as the Wolverines (17-11, 9-8 Big Ten) took down the Cats (15-14, 4-13) 70-65 on Tuesday. Coach Joe McKeown credited Michigan after the game for making big shots to hold off his team. The two teams played close for the third consecutive season. 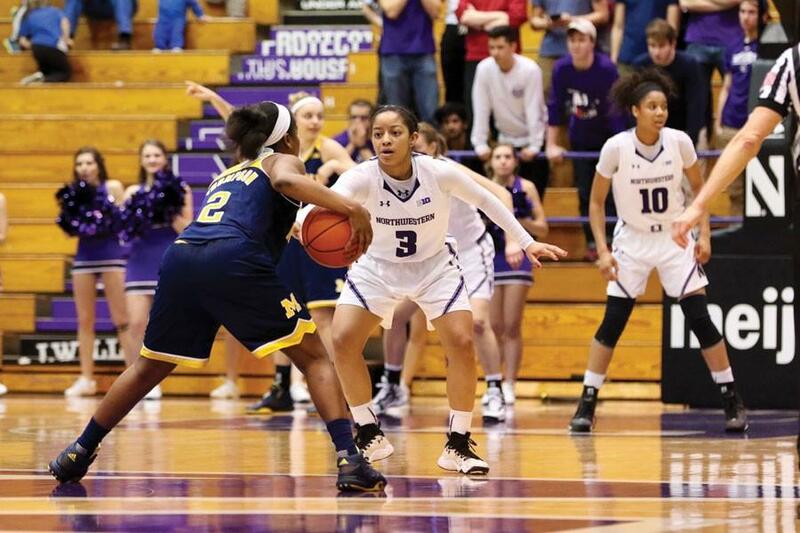 Last year in Ann Arbor, Coffey hit a game-winning layup in the final seconds to give NU a 63-62 win. Two seasons ago, Michigan hit a pair of free throws just before the buzzer in a 70-68 Wolverines win. Michigan seized control in the third quarter after neither team led by more than 5 points in the first half. Over a 5-minute span in the third, the Wolverines methodically grew their 30-25 halftime lead into a 12-point margin. NU used a 9-0 run spanning the last two quarters to pull within 4 points, but the Wolverines quickly grew their lead back to 9 after senior guard Maggie Lyon and Coffey both missed layups for the Cats. Lyon’s miss was just one misstep in a tough night for the senior playing in possibly her final game at Welsh-Ryan Arena. The Wilmette native scored just 7 points Tuesday on 3-of-11 shooting after leading the Cats with 18 points in Saturday’s victory over Wisconsin. NU fought back to make a few late runs at Michigan’s lead, but trailing by 5 with just a minute left, Coffey saw a layup attempt roll off the rim and Lyon made just one of two free throws. The Cats again drew within 4 after freshman forward Pallas Kunaiyi-Akpanah hit a layup with 39 seconds to play and had a chance to get even closer after junior guard Ashley Deary grabbed a steal in the backcourt, one of 23 Wolverines turnovers forced by NU. Deary finished with six steals and broke the Big Ten single-season steals record, but after securing the ball, she quickly fired an ill-advised and errant 3-pointer and Michigan grabbed the rebound. The Wolverines went on to close out the game at the free-throw line. Deary said following the game that she was not focused on the record. “It’s just about the team, moving forward and winning games,” she said. Michigan’s victory was keyed by its rebounding dominance. The Wolverines finished with a 42-27 advantage on the glass and had 17 offensive rebounds to 10 for NU. The poor rebounding performance was in sharp contrast to recent games for the Cats, who outrebounded six of their last eight opponents before Tuesday. Thanks to the loss, NU has once again blew a chance to build the momentum following a win. With just Sunday’s game at Nebraska left before the Big Ten Tournament next week, the Cats have failed to win consecutive conference games all season. With four seniors possibly playing on their home court for the final time, McKeown spoke about how much they have meant to the program.